Jordan Coombes is an Actor and Stunt Performer based in Dublin. She graduated from the Gaiety School of Acting’s full time programme in 2012 and from Bow Street Academy’s full time screen acting programme in 2014. Combined, both courses have provided her with extensive training in both Theatre and Screen performance. 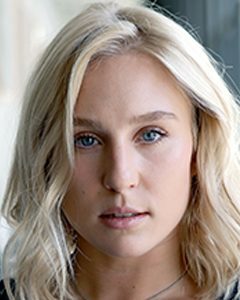 Jordan has a lot of experience in the film and Television industry appearing in shows such as Penny Dreadful, Vikings and Reign as well as lead roles in many independent features. She is also a member of Stunt Register Ireland with skills ranging from scuba diving and sword fighting to gymnastics and horse-riding. She is currently creating her own work in her spare time, having just finished a show in Smock Alley which she co-wrote and performed, she is also writing screenplays. ‘The Programme’ Screen Acting Course at The Factory. Gaiety School of Acting (Two year full time Actor Training Course).